Originally built in 1970 as an upscale complex of rental apartments and townhouses. North Shore Club has become a condominium community well known for its scenic beauty and unique setting. It is one of South Bend’s most attractive locations, nestled comfortably and quietly along the St. Joseph River in a spacious, park-like environment that to some may even seem like rural countryside. In fact, however, North Shore Club is conveniently located only a few minutes from downtown South Bend, the University of Notre Dame, South Bend Regional Airport and other popular urban attractions. In 1994 North Shore Club was purchased by a developer, and the property was converted into one owned by individual residents. 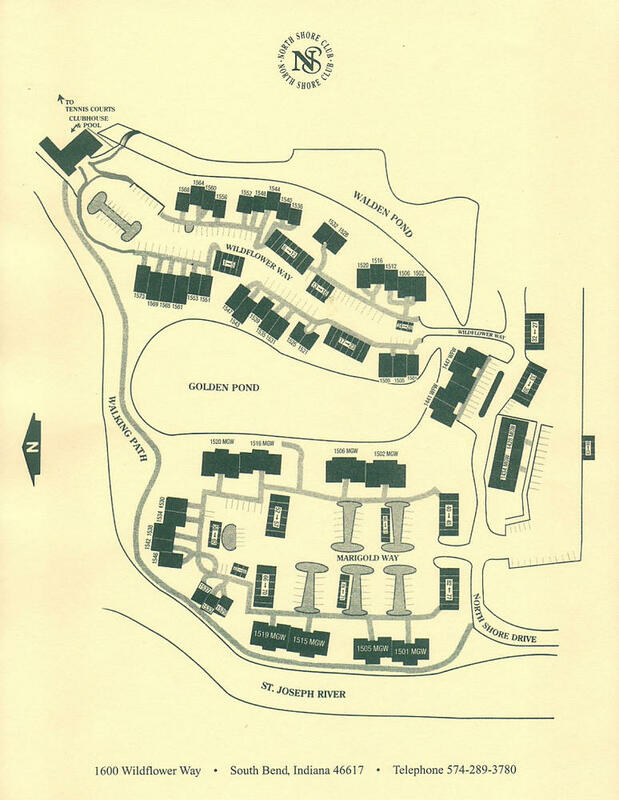 North Shore Club consists of 120 condominium units (80 apartment-style floor plans and 40 townhouses), a clubhouse, a swimming pool, tennis courts and other amenities. These assets are located in a 14.5-acre naturally wooded setting that includes two sizable man-made ponds as well as frontage along the river. Eighty percent of our units offer water views. All units contain indoor mailboxes. Q) Is North Shore Club South Bend's best kept secret? A) No. North Shore Club is a community made up of privately-owned condominiums. Q) What types of units are there? A) North Shore Club consists of one-bedroom, two-bedroom and three-bedroom (one level) units and two-bedroom with den and three-bedroom (two level) townhome units. Q) Who do I contact about purchasing a unit? Q) How much are the monthly dues? Q) What other bills can I expect beyond the monthly dues? A) In addition to the monthly dues you will be personally responsible for your electric, cable, and telephone bill. Special assessments may also be called for depending on the yearly improvements to the property. Property tax and homeowner’s insurance are the responsibility of each individual owner. Q) Do you have a swimming pool? A) Yes. We have a nearly olympic-size outdoor pool behind our clubhouse. Q) Where are the tennis courts? A) The tennis courts are a short walk from the clubhouse, in our neighboring community The Point at North Shore Woods. Q) How is North Shore Club managed? A) North Shore Club is “self-managed” by homeowners who volunteer and are elected to serve on Boards of Directors for each Association. Q) Do you have rules and regulations? A) Yes, each homeowner receives a copy of the Homeowners Reference Manual with Rules and Regulations. Also copies of the Declarations and By-Laws should be transferred directly from the seller to the buyer. Q) Do you have a staff? A) Yes, we have a property manager, an office manager, and a facilities manager. Q) Does every unit have a covered parking space? A) About two-thirds of the units have covered parking spaces. Ask us for details. Q) Is there a fee for covered parking spaces. A) In some cases there is a small annual fee if your association deems it necessary. Q) What about lawn care and snow removal? A) Yes, we contract a private company for both. Q) Are these private roads? A) Yes. We own the roads north of the paved-over railroad tracks. We also maintain the road from the paved-over railroad tracks to Angela Boulevard. A) Yes. We have a separate recycling bin that holds metal, glass, plastic, paper and cardboard. Q) Do you have garbage pickup? A) Yes. Trash in securely tied bags can be placed curbside on Monday and Friday mornings and our Facilities Manager will pick it up and deliver it to our dumpsters.